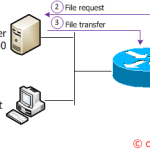 Generally to upgrade/downgrade an IOS, you use the classical ftp/tftp transfer from a laptop to a router/switch; unfortunately, there are some cases where this way is not possible, so the only solution is to use the console. Suppose you have to upload an image of about 20Mb. On a 9600bps intereface, the time required to upload this image is about 35minutes (20000000/9600)! Oh my God! Fortunately Cisco permit to change the console speed using the command “speed”. History is enabled, history size is 20. 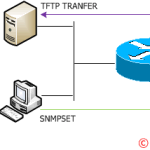 Allowed output transports are telnet. Now, the previous file of 20Mb is transferred in less than 3 minutes (20000000/115200)! Note: Obviously, when you change the console speed on your device you have to change the console speed in your terminal! Another solution to change the console speed is during the boot fase. In fact, if you enter in ROMmon mode, you can change this value using the command “confreg”. Note: Once the router boots up in ROMmon, you need to exit the current terminal session and start a new one at a data rate of 115200 bps. And what can you do if you don’t know the console speed? A solution would be to just try the eight possible console speeds above and see which one works. Another solution (for Cisco 2600 and 3600 Series Routers) would be to open up the box and move a jumper. Yes, you have understood, you can reset this value moving a jumper! Jumper J3 on the motherboard of the Cisco 2600 and 3600 Series Routers controls the speed reset. The factory default position of the shunt shorts pins 2-3. When the shunt is moved to pins 1-2, the console is reset to 9600 baud on the next power cycle. The following figures show the location of the console reset jumper, labeled DUART_RST or BAUD_RST. Remember: If you open your device, you lose the warranty. How to speed up your Cisco console connection and how to reset this value opening the device and moving the jumper.